To the right you can see our reconstruction of the most recent common ancestor of ourselves and all other placental mammals – it’s the picture at the top. Richard Dawkins and I referred to this little creature rather prosaically as “concestor 13”aWell, actually the term “concestor” was suggested by my partner, Nicky Warren. O’Leary and her colleagues took a lot of care to reconstruct this matriarch in much more detail, by collecting thousands of pieces of data from over 100 mammal species, both living and fossil. I’ve reproduced their picture under ours; it’s now been named Schrëwdinger by popular contest. I’m glad that our attempt bears more than a passing resemblance – although theirs is far more detailed in terms of dental morphology and the like. As for the lifestyle, we both went for the obvious insectivorous diet, although ours is more definitely nocturnalbA nocturnal lifestyle is supported by parsimony analysis, such as seen in . I’m normally rather distrustful of applying simple parsimony arguments to something as changeable as daytime activity patterns, especially where many of the branches span a great deal of evolutionary time. But the arguments from the structure and function of the visual system seem convincing.. I should point out that these reconstructions are very different from trying to draw a lifelike image of a known fossil – something that’s been done in many different contexts for hundreds of years. The primary source is not a single fossilcIndeed, it’s a central tenet of cladistics that it is impossible to identify ancestral species from the fossil record, but a combination of fossils, living forms, and, most importantly, reliable evolutionary trees. It’s these trees, or phylogenies, together with assumptions of how evolutionary changes occur, that allow us reconstruct our ancestors in an informed way (known technically as “inferring ancestral character states”). I did this in a rough and ready way for The Ancestor’s Tale. I’m glad that the authors of this paper are now doing it more rigorously. This xenarthran reminds me that it’s time to finish this blog post and go to sleep. By the way, the paper’s not just about a single animal. It’s titled The Placental Mammal Ancestor and the Post−K-Pg Radiation of Placentals, and the meat is really in the second part of the title. The authors use evolutionary trees produced from their extensive morphological dataset, supplemented by some carefully chosen DNA sequence data, to argue an alternative version of history to that which we wrote in The Ancestor’s Tale. One simple difference is their deduction that the earliest diverging placental mammals were the South American xenarthrans like the one on the left, not the afrotheres. I’d be happy with this conclusion, although I suspect the jury’s still outdGratifyingly, in the book we did anticipate this change, stating that “the order of Rendezvous 12 and 13 is not entirely resolved”. What is much more radical is their conclusion about when things happened. In the Ancestor’s Tale we took the then-orthodox view that although mammals evolved into radically different forms after the extinction of the dinosaurs, their principle lineages were founded tens of millions of years beforehand. In reference to a similar argument about the Cambrian “explosion”, this sort of explanation is known as a “long fuse” model. In the schrëwdinger paper, the authors claim that the evolutionary branching occurred at almost the same time as the adaptive radiation. Their method of calibrating the time of evolutionary branching found no fuse at all. For what it’s worth, I’m not yet inclined to their point of view: I think it highly likely that similar-looking placental mammal species could have existed for tens of millions of years during the Cretaceous, distinct species which then radiated in different directions rather rapidly once ecological opportunities presented themselves after the great Cretaceous extinction. In fact, a more recent paper has argued that their dating method doesn’t account enough for the patchiness of the fossil record. 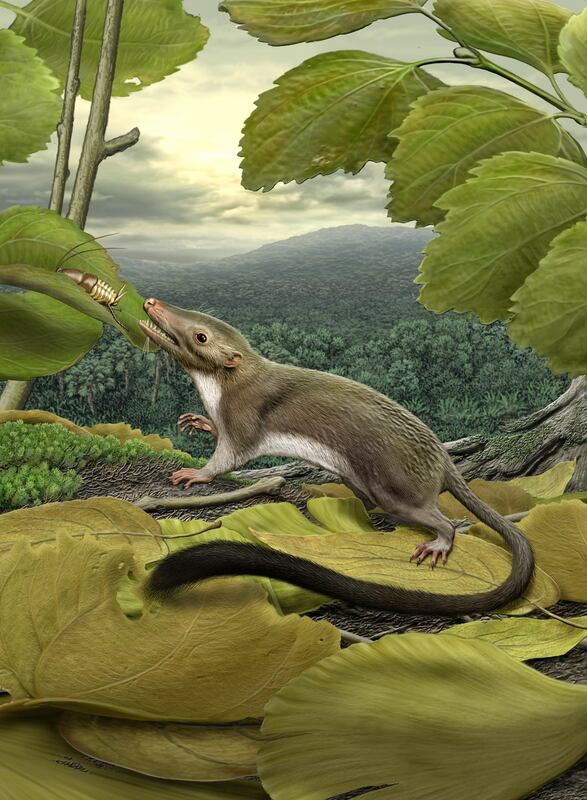 I’d tentatively predict fossil discoveries of Cretaceous placental mammals in the future. However, this isn’t the place to go into arguments in detail, interesting though they are. The main point of this post is a visual one. Concestor 13, shrëwdinger, or whatever you choose to call the creature, undoubtedly gave rise to a huge diversity of animal forms – all the modern placental mammals we see today. Imagine visualising this using photo mosaics: our common ancestor composed of tiny pictures of all of her living descendants. I say “all”, but the most obvious source of freely reusable images of all lifeforms is the Encyclopedia of Life, which – as of June 2014 – has freely re-usableei.e. images in the public domain or simply requiring an attribution line (Creative Commons CC-BY) images of only about 30% of the 4715 speciesflist from , courtesy of James Rosindell of placental mammal. The mosaic above is made of 670 images – that’s 15% of all placental mammal species – chosen on the basis of “quality” (more specifically, with a user-solicited rating over and above the default 2.5 out of 5 stars). It was constructed automatically using my EoL image scraping code, together with a piece of free software called MacOSaicsX, then turned into a clickable PDF using the freely available PdfClown software. I’d recommend looking at the higher resolution PDF file: not only can you actually see the miniature pictures and their authors, but they are clickable and hyperlinked to the appropriate EoL page. Working out ways to automatically create this mosaic is what kick-started my involvement with EoL about a year ago, leading me to find ways to identify mis-classified maps, grab more content from Wikimedia Commons, search for public domain images, and so on. It strikes me as a worthwhile endeavour, because the automated use of free and taxonomically identified images of lifeforms opens up many other possibilities. The OneZoom project, although the public version doesn’t yet have images. For example, I’ve used the same computer script to provide images for the OneZoom project. And if you are involved in a project that needs pictures of more than 30% of the placental mammals, you could include non-commercially usable pictures (which takes the mammalian total to 35%), or even pictures distributed with a share-alike license (which gives a grand total of 2345/4715 species with images, or about 50% coverage). This is quite a reasonable number – although I must note that it drops to 38% if you want to exclude images of “unverified” taxonomic statusgIn my mosaic, 197 of the 670 high quality images were “unverified”. I also suspect that the figures for mammals will be much higher than for all other groups, except perhaps birds. It’s something that can easily be extended to any groups of plants or animals. But, as with any automated process, there are a number of caveats. Sometimes the best (or only) image of an organism will be an illustration from an old book, a skull, awful taxidermy, traces of footprints, or even (accidentally) a species distribution map. Most of these can be avoided by choosing only images with a rating >2.5 stars. Other problems can be caused by bad classifications sneaking onto EoL, or because the organism isn’t in the centre of the photograph. In fact, I’ve spent some time setting nice thumbnail crops on EoL for many of these photos, so complete automation for other groups of creatures is still a pipe dream. Nevertheless, l feel this is a very good start. And it’s also allowed me to produce another nice visualisation, which I’ll save up my sleeve for another blog post. b. ↑ A nocturnal lifestyle is supported by parsimony analysis, such as seen in . I’m normally rather distrustful of applying simple parsimony arguments to something as changeable as daytime activity patterns, especially where many of the branches span a great deal of evolutionary time. But the arguments from the structure and function of the visual system seem convincing. This entry was posted in Musings, Referenced by Yan. Bookmark the permalink.